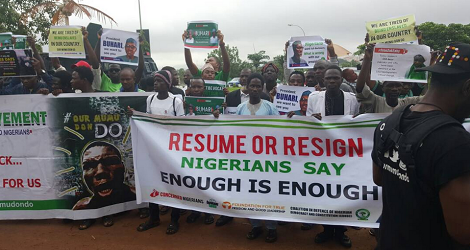 A coalition of Civil Society and pro democracy group under the aegis of Concerned Nigerians today staged a peaceful protest march in Abuja asking ailing Nigerian President Muhammadu Buhari to resume or resign his office after he spending 92 days in London on medical rip. 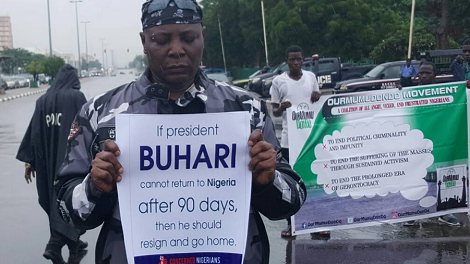 They carried placards with inscriptions; "Resume or Resign Nigerians say enough is enough"; "Buhari ! Where are you?" 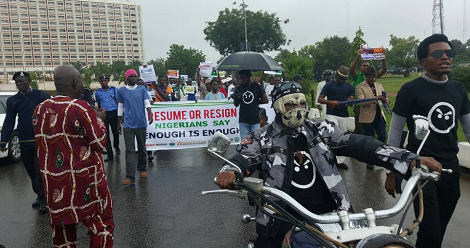 "We Are Tired of Being Enslaved in Our Country," "Our Mumu Don Do"; "Buhari Called For Impeachment When Yar'adua Was Sick, Now We Are Calling For Same." 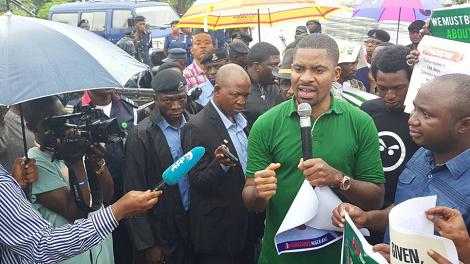 Heavily armed mobile police men accompanied the protesters as they moved toward the gate of the Presidential Villa where they vowed to occupy until the President accede to their demands.